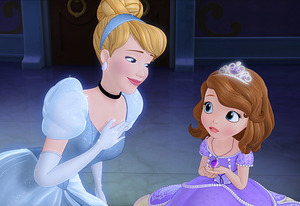 Cinderella and Sofia. . Wallpaper and background images in the Sofia The First club tagged: cinderella sofia the first disney princess. Thank you me too. If WD was alive and he sees this he will fire everyone that agree with this new look. I personally love Cinderella's new look. Her bun is prettier than what she had before. I don't even know if you could call what she had before a bun.